Find an empty medium-size shoe box, cover the box in gift wrap paper making sure that you wrap the lid and box separately. 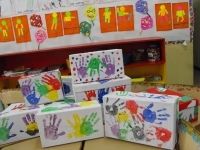 You may like to hand paint the shoeboxes or decorated it be as creative as you like! 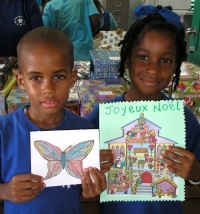 Seen here some decorated by Erdiston's Pre Primary school children. 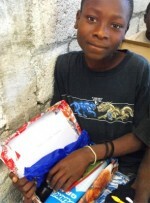 Decide whether your gift will go to a BOY or a GIRL and the age category. 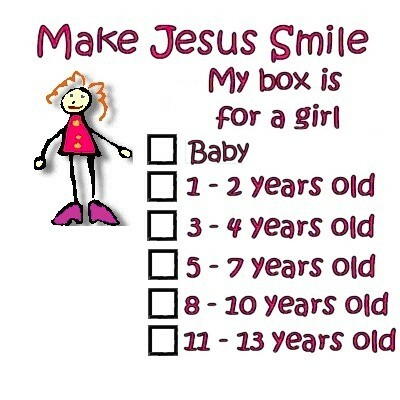 Choose the boy/girl label and tick the box for the age group. Tape the label to the outside of the lid – on the top right just as you would a stamp on a letter. 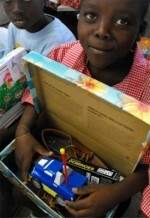 Seen here an orphan at the Maranatha Ministries Orphanage receiving her Christmas 2008 Make Jesus Smile shoebox thanks to Power in the Blood Sunday School class in Barbados. 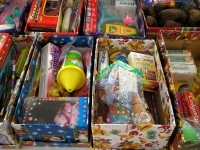 Fill the shoe box with the gifts listed on the 'What to Pack' webpage. Please do not wrap any items individually, customs will only make us open them. You may want to make a special greeting card for the child. Be sure to include your name and school, church or organization. 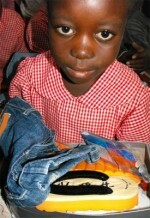 Seen here the children of the Caribbean Development Bank Sunshine Club. Please secure the lid with an elastic band, and DO NOT seal the box as it will need to be checked to ensure it meets Customs requirements. 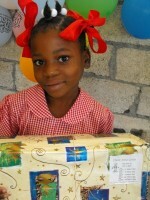 Seen here the children of Haiti receiving their Make Jesus Smile shoe boxes.